Hello from Paris! Not only am I going to give you a faire la bise (kiss on each cheek) I’m going to kiss the ground that we are finally here! The last two days of travel haven’t gone as smoothly as hoped with over 7 hours of plane delays leading to a flight cancellation and having to take the same flight 24 hours later. But to take the Kimmy Schmidt angle on things I met a cool bikini designer, Kimber Frankel, who was traveling to debut her line in Cannes (we talked for hours over a good Bordeaux) and I’m now with my best friend, Geoff, in arguably the most romantic city on earth and having a lovely meal. Travel problems? Already forgotten. 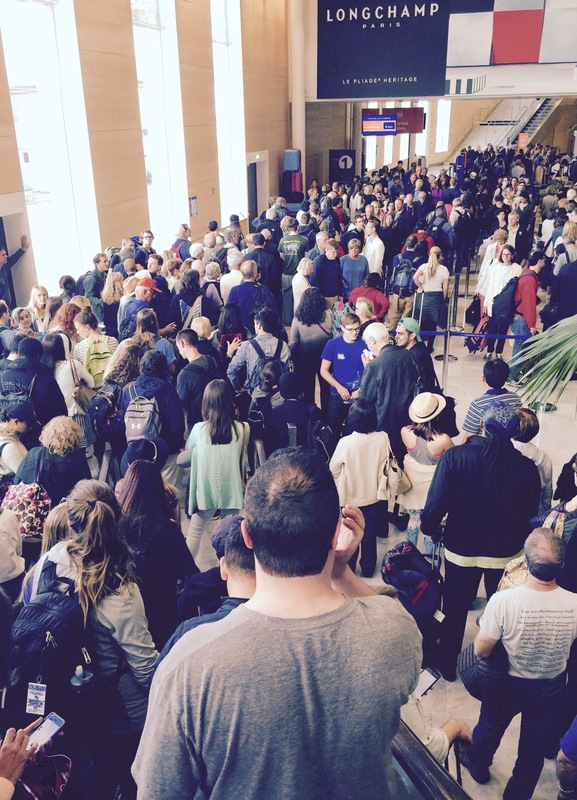 Waiting in the French Customs line. My view from the escalator. 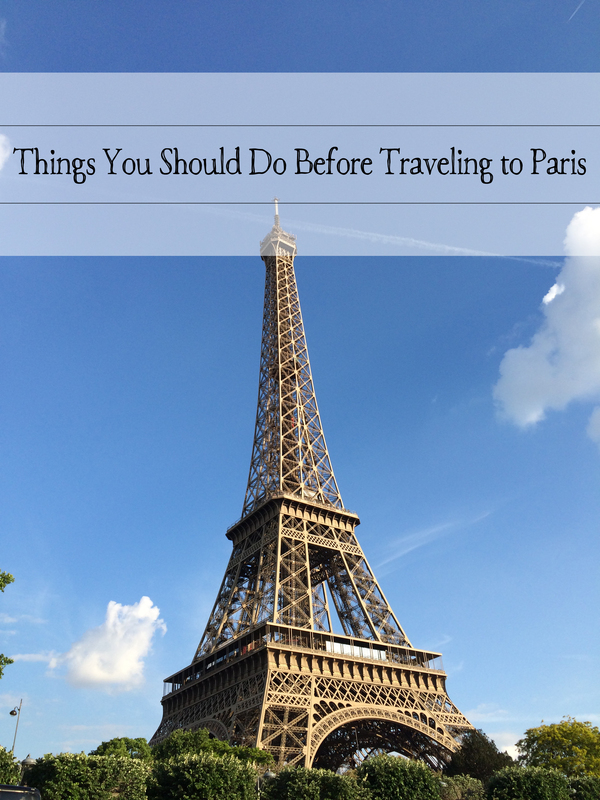 But while it’s fresh in my mind I wanted to share some things you must do before embarking on your trip to Paris. These can really be used for planning to ANY European City within the EU. Some of these things I’ve done in my international travels and some I wish I would have done (so please learn from my planning and lack of). Some to dos on this list aren’t fun or glamorous but they are necessary, so if you get them done ahead of time you can just focus on being your fun and glamorous self while exploring the beautiful city instead of worrying. 1. Visit Trip Advisor for ratings: Yes they receive ad dollars from retailers and restaurants but in my mind the key is the ratings system. Review everything from your hotel, to worthwhile sites to tour companies. Your time and money are valuable and this helps cut through the clutter. Also reach out to friends who have been there. 2. Order currency through your bank. The dollar is strong (yay!) but you still need to deal with currency exchange fees. Banks offer better rates and fees than if you were to exchange at an airport or your hotel. Give yourself a couple of weeks for this. Rely on currency for tips, but try to really utilize your credit cards (keeping in mind the point below). 3. Watch Out for International Credit Card Fees: Call your credit card company to find out if there are fees associated with your cards. My American Express cards have no fees while my Visas do (too bad American Express isn’t accepted by many of the Taxi drivers and small cafes in Paris). 4. Let your Credit Card Companies Know you are Going Out of the Country: Give them exact dates so they can log them in the system. This way there will be no decline surprises when you go to buy that Louis bag you’ve been dreaming of. 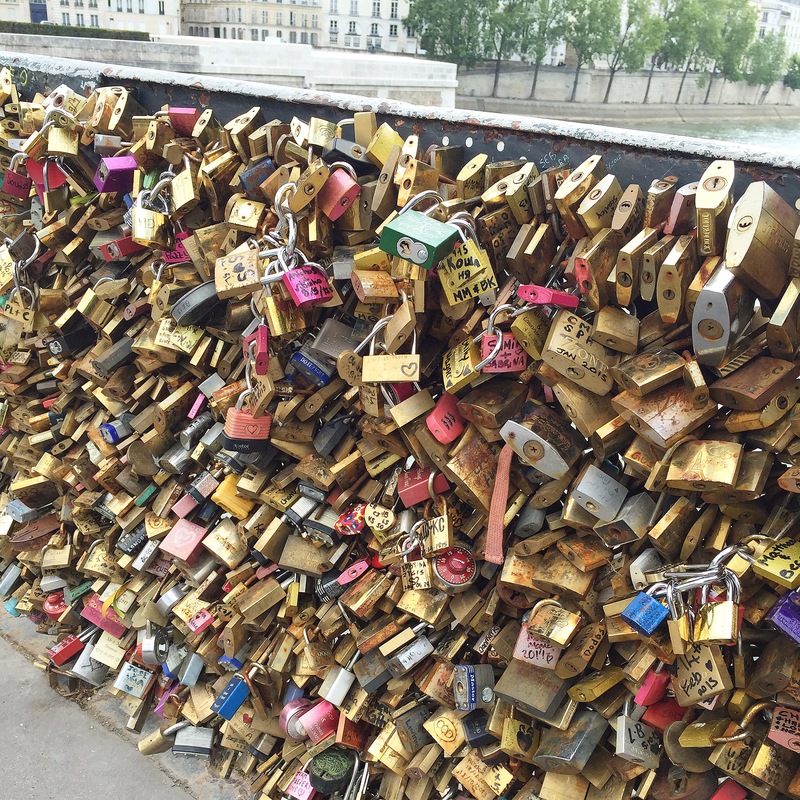 Love locks along the Seine River. 5. Utilize Apple Pay: If you have an iphone load all of the cards you will be using into Apple Pay. This way if your cards get stolen you will know right away if someone is making a transaction because it will show up as a message on your phone screen. 6. Make Copies: Make 2 photocopies each of your passports, front and back of credit cards and health insurance cards. One copy should travel with you in a safe place and the other copy should be given to a loved one at home that you can call on in an emergency. Obviously you photocopy the card front for the numbers and the back for international customer service phone numbers in case your cards get stolen. 7. Add Contacts: Make sure your phone is password protected (finger print recognition is even better) and also add your CC numbers and corresponding customer service numbers to the contacts. 8. Have “Just in Case” Documentation: No one wants to think “what if something happens to us while our child is at home” but (sorry to infringe on your positive energy) you do. Geoff and I have a Medical Authorization Form authorizing our parents to get medical treatment for our son in our absence. This is signed by both of us. As an aside you may also want to call the Pediatrician and let them know the dates you will be traveling and who will be watching your child during these times. 9. Read up on VAT taxes: If you are going to be shopping in any country that is part of the EU then you may be able to get back the European Union Value-Added Tax, which ranges from 15 to 25% per country. This is because unlike the US that adds their sales tax according to state, in EU countries it is part of the retail price. Since you are not a resident you are not entitled to pay this. If you have traveled to Europe before then you know the routine including the forms and where they need to be stamped. But if you are a first-timer please visit here to read up on what you need to do as well as the rates and retail thresholds. 10. Download the itranslate app: People are just nicer to you if you attempt their language. It is easier than ever to try a few phrases by downloading this app. I’m also a huge fan of Duolingo (for fun practice) and French Verb Conj (for verb conjugation). 11. Call your phone provider: Ask them the fees associated with using your phone overseas including roaming, data charges, etc. Also know the country code (France is +33). 12. Read up on Pickpocketing Schemes: This sounds like overkill, right? I thought so until a girl came up to me and asked me to sign a petition she was working on. Before I left for Paris I read about how one of the stealing methods was to have a bunch of teenage girls surround you while one asks you to sign her clipboard as a distraction. Obviously I told her to get away from me in her bedazzled mess of an outfit, but what if I wouldn’t have read about this in advance? I found this post helpful b/c I’m planning a trip to Paris in a few years. I have a family travel blog but I enjoyed reading this one for any of my solo or couples trips that I’ll be planning! Let me start by saying I love your posts!! My husband and I are going to Amsterdam and Paris over the Christmas holidays. This is my first trip to Europe, so needless to say, I’ve been doing a lot of research on EVERYTHING!! Your posts have been most helpful!! I just realized you are very close to me….we live in Cornelius. I would love to hear any recommendations you may have for a really nice restaurant in Paris as well as suggestions for shopping. I look forward to hearing from you! Thank you for the recommendation! We are staying at the Sofitel Paris le Faubourg right off the Champs Elysees so that restaurant may be just perfect! I have to tell you…the pictures you posted of your Delsey luggage prompted me to buy two pieces for myself. They just arrived yesterday and I have to say, they are gorgeous! I got the same bags but in black. Thanks for the tips as I am planning a first time trip to Paris soon. My main concern at this time is how to get from the CDG airport to our hotel in Paris and then onto Le Mans via train. Any tips would be appreciated. Bonjour, This was such a delightful read… The packing is critical for me as I seem to think I have a 2nd plane following us with my wardrobe! HA.. Parisians dress so elegantly with a flare of simplicity. They do not appear to require the ridiculous amount of clothing we ( Americans) have. On that note, my passion and degree are in fashion design. Your list was perfect. My S.O. 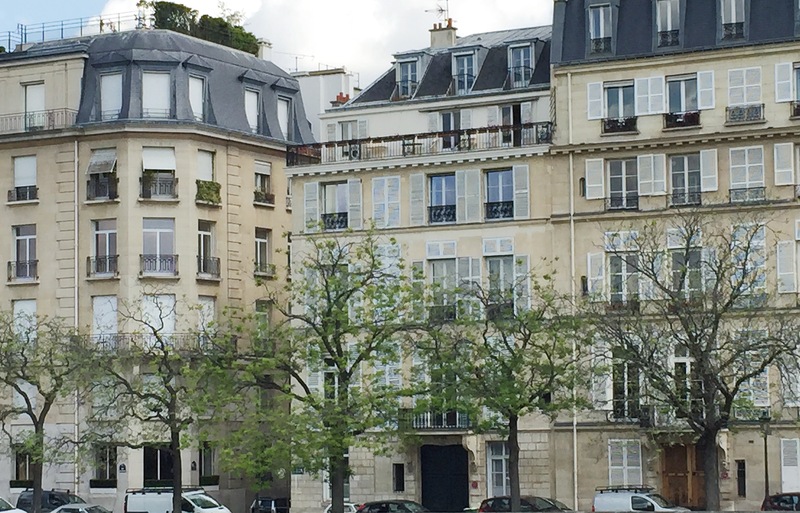 ( significant other) went to boarding school in Paris and his sisters live there. 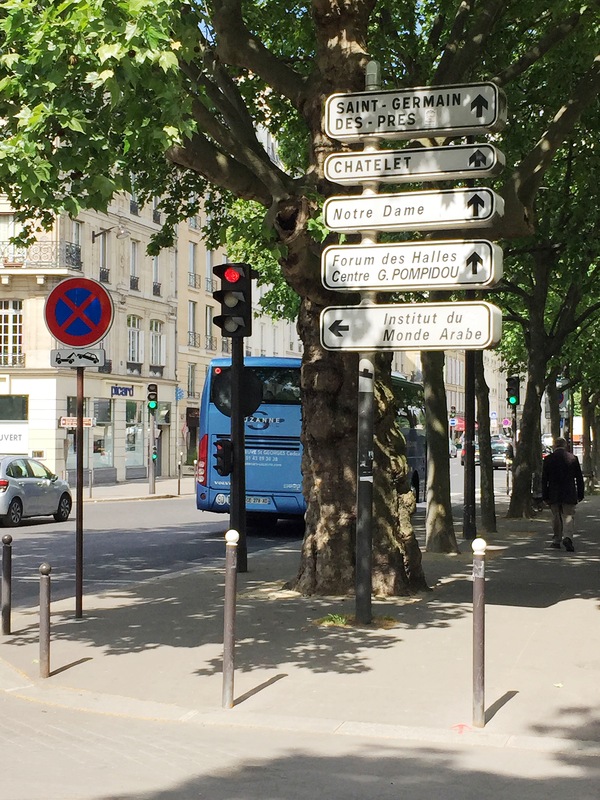 So a week in Paris & a week in Bordeaux… If it’s up to me, I will only want to use my plane ticket to Europe. Coming out of the Deep South in August where temps are so hot and oppressive; it’s quite hard to pull out my fall clothes and get excited about Cashmere & Boots. Our adventure begins in October. Also a huge MERCI on the app for the conjugating verbs. It’s been a while since I have spoken French. I downloaded the other apps as well. Merci Beaucoup….. I love this…We are Paris bound this coming October and these were all helpful tips… I feel more prepared for our trip abroad.